Independent Grocers Alliance (IGA) is a chain of supermarkets in America. To date, there are almost 5,000 stores across the US and abroad, with each supermarket distinctly unique. 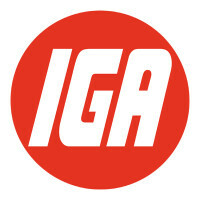 In 1926, J. Frank Grimes and a group of other retailers established a single marketing system, which later on became IGA (hence the term “independent grocers”). The company first ventured into its own canned food brand. Over the years, the company welcomed more retailers into its family. By 1930, there were already 8,000 grocery stores operating under IGA. However, these stores remained to be independently owned. Aside from offering competitive wages, the company provides the following benefits to its employees and new hires: paid on-the-job training, flexible working hours, and opportunities for professional development. The company is raking in positive reviews from its previous and present employees. The management assists the staff, especially those who are still new to retail. Employees are likewise motivated to seek and work for promotions. The minimum age requirement for applicants is 16 years old. However, minors may be required to obtain special authorization from schools and/or local governments. Applicants for managerial positions should be 18 years old. The company is looking for energetic, fun, professional, friendly, and committed people who can represent IGA and share its mission and vision. The following are the top 10 jobs at the company, which have been categorized into department and management positions. Front End team members are the face of the company. They specialize in customer service, ensuring that guests are served promptly. Cashiers, more specifically, handle money transactions, accept payments, give accurate change, and perform other duties in the supermarket. They also adhere to the company’s policies and standards. The Produce and/or Floral Clerk is a customer-driven specialist who arranges items for display, promotes goods to customers, attends to customers’ needs, checks the freshness of stocks, and replaces items whenever necessary. He must possess the willingness and desire to help guests at all times. The Meat/Seafood Clerk always makes sure that stocks are fresh and fit for consumption. He shall inspect the meat products delivered to the supermarket and prepare them for display. He also wraps them and attaches price tags for customers. The clerk must be highly knowledgeable about each product. Grocery team members always check whether items have enough stock and carefully arranged on shelves. They put price tags on merchandise and attend to customers’ needs. Moreover, they help guests locate items or replace damaged goods. They also ensure groceries are still on their sell-by dates. Although there are only a few stores with a coffee bar, this section of the supermarket is frequented. Thus, it needs attendants who are physically fit, enthusiastic, friendly, and highly organized. Their primary tasks are to prepare refreshing drinks and quick snacks to customers, create specialty beverages, and provide exceptional customer service. Deli Clerks prepare deli meats, gift baskets, cheese, salads, sandwiches, and entrees to customers. They shall see to it that the food items are always fresh and comply with national food standards. Because he has to stand for long periods and lift heavy items, a deli clerk must be physically fit. A bakery clerk is assigned to prepare baked goods for customers. He shall pack or wrap pastries and cookies, and ensure all items on display look presentable. His job, however, is not limited to front end assignments. He must have organizational and time management skills, should he be called to perform other duties in the supermarket. The Front End Manager supervises all front end operations, including cashiers and customer service representatives. He shall serve as the primary contact for customers’ requests, queries, complaints, and other similar interactions. In addition, the Front End Manager shall see to it that the team performs their duties accurately and efficiently. In the absence of the Store Manager, the Assistant Store Manager shall assume their higher up’s duties and supervise the staff. He shall focus on store operations, cleanliness of the store, promotions, merchandising, and deliveries. He shall also monitor whether the team provides quality customer service. At the end of the day, he shall evaluate whether sales targets have been achieved. The overall financial success and appearance of the supermarket is delegated to the Department Manager, who supervises order and deliveries, customer relations, merchandising, staff performance, and inventories. He screens, trains, and motivates his team to perform superior customer service and achieve profit goals. Once you have seen the job you like, click the red button at the bottom of the careers webpage. You will then be asked to fill out an online employment form. This employment form shall ask for your preferred position, location, and availability. You also have to leave your contact details, as well as upload your resume. The resume should be parallel to the details you will encode in the form. However, the form only asks for a few pieces of information, i.e., three entries for the previous job experience section. IGA prefers that resumes have detailed accounts of relevant skills and work experience. If possible, include any training related to the job you are applying for. The interview shall follow shortly upon your submission of the resume and application form. Within a week, you will receive either a phone call or an email regarding your job interview. The company is known for instilling values of integrity and professionalism, as well as for putting people first. As much as possible, employees must enjoy work-life balance, and the management must be a role model to everyone. IGA also encourages customers to join its Global Rally Agenda, a business session composed of workshops and talks on how to make IGA retailing more profitable and innovative. In the past, the company has hosted community-focused events such as the Hometown Healthy Challenge; Hometown Fest; Family, Friends & Food; and Purina Picture Pawfect Pet Photo Competition. But the company is not just interested in fun projects. It also helps underprivileged and struggling children. In 2017, the supermarket chain collaborated with Drug-Free Kids and launched the IGA Cares Initiative. 1 How old do you have to be to work at IGA?